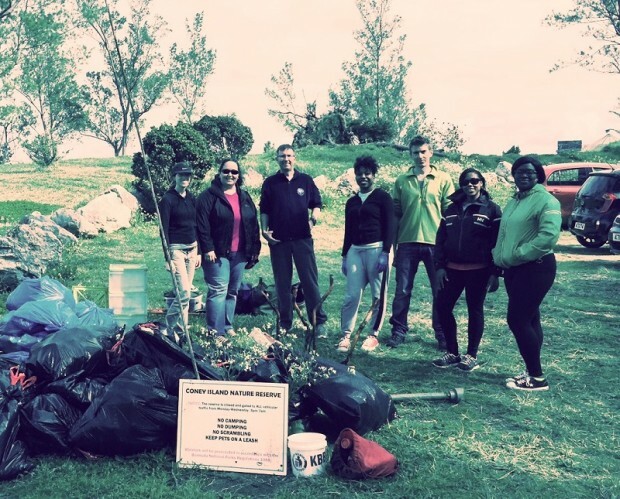 Keep Bermuda Beautiful [KBB] reports a busy weekend of clean-up activities with 125 volunteers in 11 locations across the Island removing more than 4,100 pounds of litter and debris. More people are helping to clean up the Island’s litter problem and are coming out in force to volunteer in their communities, KBB said. On Saturday [Mar 14], eleven teams of volunteers from Colonial Insurance, OBA, Fairmont Southampton Hotel and the Catholic Diocese combed Bermuda’s roadsides and railway trails to remove approximately 2 tons of litter from the environment. KBB executive director Anne Hyde said, “KBB is delighted to see so many concerned individuals together with colleagues and family members joining in the battle against the Island’s litter problem. The action of doing a cleanup can be an education in itself for those who participate. “Not only do we find household trash and food wrappers but also recyclables, appliances and other bulky waste dumped without a thought by irresponsible people. It is ugly to look at, it breeds mosquitos, rats and other vermin, and can kill wildlife. All these items can be properly disposed of by residents with basically the same amount of effort and without damaging our beautiful Island. Colonial Insurance Group initiated its first Community Service project with Keep Bermuda Beautiful, starting with a Lunch & Learn session describing Bermuda’s litter problem and concluding with Saturday’s cleanup. 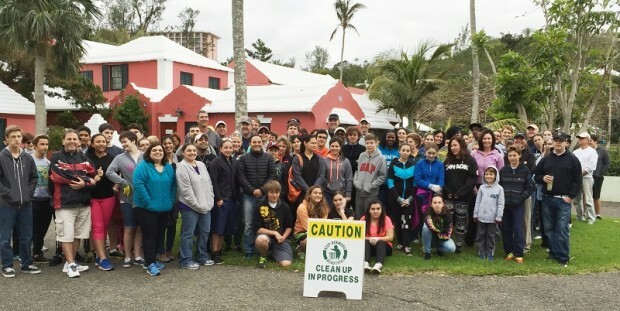 Three teams organized by Sheldon Maybury and Ron Spencer completed clean ups around the Somerset Cricket Club, past the Paget Plaza and traffic lights, and along Devon Springs Lane. One Bermuda Alliance organized its annual Devonshire Region Cleanup. Sony Kessaram, Lisa Whitehead and Fabian Minors helped lead the teams on Watlington Road, Barkers Hill and Devon Springs Road. Deputy Premier and Minister of Finance Bob Richards and Minister of Public Works Craig Cannonier joined volunteers to collect roadside litter. 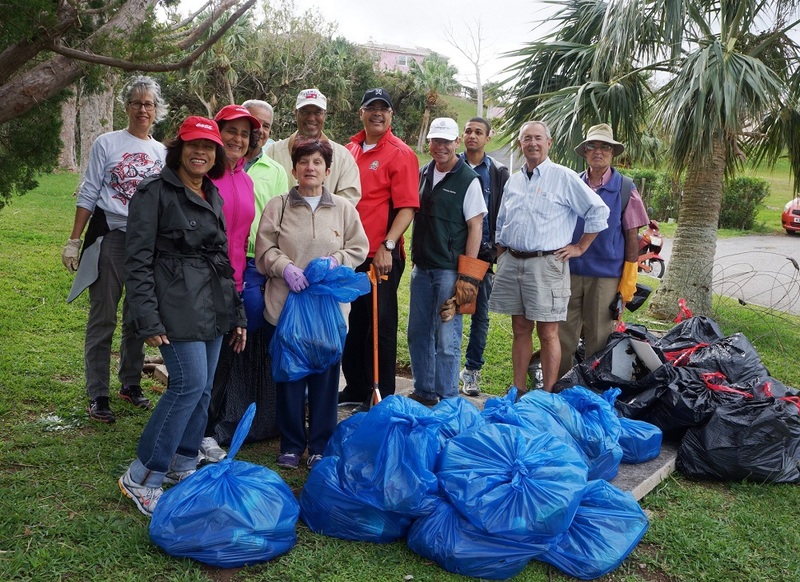 The Fairmont Southampton Hotel in partnership with the Catholic Diocese of Bermuda formed five teams to cover several miles of the Southampton Railway Trail for their 4th Annual Trail Cleanup. The Hotel’s Green Team has adopted the Trail and is committed to keeping it litter-free for their guests as part of KBB’s Adopt-A-Spot Programme. The Catholic Diocese confirmation students have partnered with the Hotel for their community service project and both parties benefit from this successful collaboration. Hotel organizers Pierre Jean and Darren Chichester and the Diocese youth coordinator Essie Hans work with KBB to plan this annual event. In addition, employees at Hiscox have adopted Coney Island as part of KBB’s Adopt-A-Sport Programme and came out on Friday 13 March to complete a big cleanup of the area. Wow! Very impressive. Well done to everyone involved, what a great job. Well done by U.B.P……… I mean K.B.B. So the ubp picks up trash…I guess the plp…sorry their supporters, are the ones throwing trash and illegally dumping? A shame that is the same people time after time who clean up after the thoughtless slobs of Bermuda. This is the kind of work that prisoners & people on community service should be doing. Agreed: does anyone know what people on community service actually DO? This would be an ideal job for them. Mind you, it’s a sad reflection on the residents of Bermuda that this job has to be done at all. Look at the litter that’s left after every big parade. People brought it, people should bin it: it’s not that difficult a concept to understand! I thought this too but most of it is from the huricains. Well done to all. What a great contribution everyone made! Well done everyone! 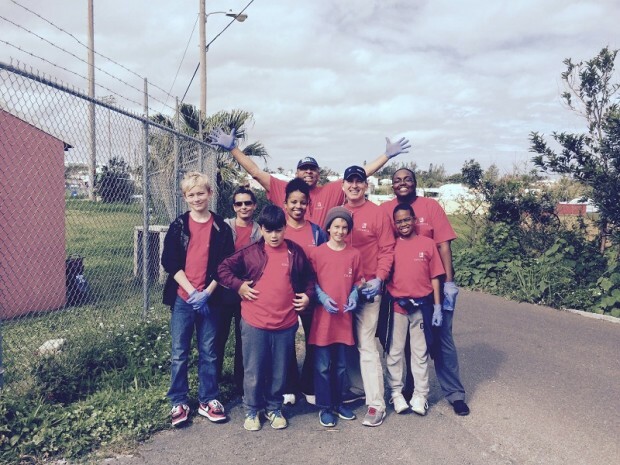 It is so important to keep the island clean and free of trash. The Railway Trail from Cobb’s Hill to Riviera Estate is a disgrace. Hopefully we can get a team together to clean up this area too. I have done this with my kids (although unable today, sadly). It is a great feeling of giving back and teaching the kids about how easy it is to thoughtlessly throw trash … until they are the ones picking it up, again and again and again. They NEVER walk past litter now without picking up and disposing it properly. You are amazing!! You are all just awesome! When I would go to the beach after this clean up the beach is just so fresh!! You have a beautiful country and YOU all make it that way! Can we get a cleanup around by fort st catherines beach please. I went for a drive this weekend and it looks horrible around there. Beach was littered with debris, an old boat, and tress all over. You can contact KBB and initiate your own clean up. KBB can provide trash/recycling bags and gloves. You just need a few people to help for a few hours! KBB is a non-profit so relies on the community to rally for these clean-ups.